Wanting to create a memorable cake for your next party? Or just for fun? Then you should call Piece of Cake Tin Hire! 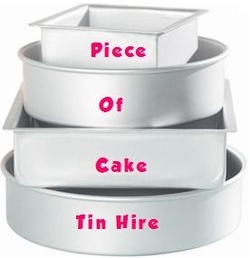 Hire a cake tin for a fraction of the cost of buying one new! Piece of Cake Tin Hire has a wide range of novelty cake tins (also called cake pans or cake moulds) including 3D and Character tins. Decorating tips, Fondant tools, Cake Toppers and Cookie Cutters are also available for hire. They are perfect for kids birthdays, adults birthdays, baby showers, bridal showers or any time you want to bake something a little special. Our cake tins allow even a novice baker to make professional looking cakes. Based in Porirua, Wellington we are conveniently located for our customers in the Wellington region including Kapiti, Upper Hutt and Lower Hutt. Check out our gallery to see our wide range of cake tins for hire and our inspiration page to see they many ways they can be decorated. Follow our blog to find some great party ideas and recipes.